The Muslim Public Affairs Council (MPAC), the Council on American-Islamic Relations (CAIR) and their ideological allies have called FBI searches of people suspected of supporting terrorist organizations in Chicago and Minneapolis "fishing expeditions" that trample the rights of innocent people. The terror-financing prosecution of the Holy Land Foundation for Relief and Development (HLF) was denounced as part of a campaign targeting Muslim charities. But the evidence convinced a jury beyond a reasonable doubt on 108 counts and led the presiding judge to conclude that "the purpose of creating the Holy Land Foundation was as a fundraising arm for Hamas." The September 2001 FBI searches of a Dallas-area business, Infocom, were condemned as an anti-Muslim witch hunt. Yet resulting criminal trials ended with convictions against five defendants. The 2003 indictment of University of South Florida professor Sami Al-Arian on charges he helped lead the Palestinian Islamic Jihad (PIJ) was dismissed by CAIR and MPAC as a politically motivated attempt to silence critics of Israel. Evidence showed Al-Arian, in fact, served on the PIJ's governing board and he pled guilty to conspiring to provide services to the terrorist group. And these groups will be wrong this time as well, experts say, because the FBI follows a rigorous procedure aimed at eliminating such excesses. The latest case became public late last month, when the FBI executed search warrants in Minneapolis and Chicago as part of an investigation into material support for two terror groups: the Popular Front for the Liberation of Palestine (PFLP) and the Revolutionary Armed Forces of Colombia (FARC). MPAC attacked the searches as "a fishing expedition" and claimed the U.S. government showed "no regard for nonviolent work." The organization said that, absent evidence that the targeted groups were "planning terrorist operations," the justification offered for the raids is "absurd." As we noted previously, MPAC officials' comments show they either don't know what activity is barred under U.S. law, or don't care. It isn't necessary for the government to show that someone was "planning terrorist operations" to demonstrate that the suspect is providing material support to terrorists. In fact, the U.S. statute barring material support covers both violent and nonviolent help because Congress found foreign terror groups "are so tainted by their criminal conduct that any contributions to such an organization facilitates that conduct. In upholding the law, the Supreme Court recently ruled that such support also "helps lend legitimacy to foreign terrorist groups – legitimacy that makes it easier for those groups to persist, to recruit members, and to raise funds – all of which facilitate more terrorist attacks." CAIR denounced the FBI for searching the Chicago home of Hatem Abudayyeh, executive director of the Arab American Action Network. Ahmed Rehab, executive director of CAIR's Chicago chapter, called the investigation "a waste of taxpayer dollars," "a new low," and "an example of FBI overreach when it comes to activism or commentary on the (Middle East) conflict." In reality, neither CAIR nor MPAC (or for that matter, any other outside party) has any way of assessing the quality of the evidence collected in the investigation because it hasn't been made public. So at this point, there's no way to determine if the groups' latest attacks on law enforcement have even a shred of merit. A healthy skepticism is warranted given the groups' long histories of depicting virtually any law enforcement action against terrorism as an attack on all American Muslims. Those earlier cases also included accusations that it was Bush administration policy driving the cases. Last month's searches were managed by the Obama administration's Justice Department, but the attempt to undermine law enforcement action is just as swift. Time and again, CAIR and MPAC have attacked law enforcement's handling of high-profile terrorism-related cases, suggesting that "innocent" Muslims were being targeted - before these individuals were convicted and sentenced to prison. In the HLF case, a Dallas jury in 2008 convicted HLF and five former leaders on 108 counts for supporting Hamas. Last year, the five were sentenced to prison terms ranging from 15 to 65 years. Similarly, the Infocom case ended with a series of convictions. After one verdict, CAIR's Dallas-Fort Worth chapter issued a release saying it reflected "a growing disparity and climate of injustice for Muslims, who we feel are being selectively prosecuted and given unfair sentences." Former federal prosecutor Nathan Garrett, a member of the prosecution team in the Infocom case, said the attacks on FBI in the FARC/PFLP case remind him of the broadsides directed at law enforcement in the Infocom case. He said the fact that Infocom officials were convicted and sentenced to prison demonstrates just how misinformed the critics were. 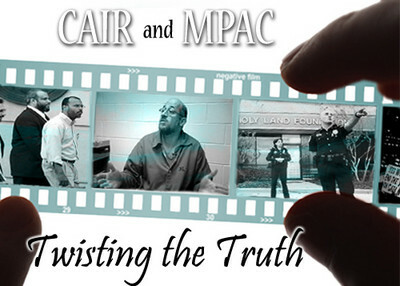 Read more about CAIR and MPAC's records of defending accused and convicted terrorists here and here. Former law enforcement officials say there are numerous checks and balances built into the investigative process that make it virtually impossible for the government to engage in "fishing expeditions" against law-abiding individuals as critics like CAIR and MPAC allege. FBI agents investigating terrorism cases face intense scrutiny inside and outside the Bureau from supervisors whose job is to ensure that all information gathered will stand up in court, according to Garrett, who was also a member of the prosecution team in the HLF case. Garrett (who had previously been an FBI special agent) said that agents investigating a terror case report to an array of commanders and senior bureau officials, including squad supervisors. Officials from FBI international terrorism branch in Washington are involved in terrorism investigations from the outset. And the Justice Department also weighs in in deciding whether an investigation can go forward. "You don't want something going to court and having a judge say, 'That's a terrible [search warrant] application. I won't sign it," said Robert Blitzer, former chief of the FBI's Domestic Terrorism/Counterterrorism Planning Section. Judges "aren't hesitant" about challenging warrant applications because they don't want their rulings overturned by appellate courts, he said. Garrett said he has never encountered a federal judge "who was afraid to question, challenge or push back" when he or she found a warrant application to be flawed. "We couldn't just go out 'fishing' without substantive evidence" of criminal activity, said Dennis Lormel, who established the FBI's Terrorist Financing Operations Section after 9/11. "If we overstepped our authority, Congress would strip us of authority." Lormel, who retired from the FBI in 2003 after 28 years of service, said that offices of professional responsibility in the FBI and the Justice Department also function as deterrents to misconduct. He said federal magistrate judges would sometimes "bend over backwards" to protect criminal defendants. Garrett said he welcomes criticism of government overreach because it is necessary to prevent violations of individual rights. But he told the Investigative Project on Terrorism that he is frustrated by rhetoric suggesting that the FBI is prosecuting "innocent charities." The terrorist organizations deliberately disguise front groups as legitimate charities because that makes it relatively easy to portray law enforcement as the villain – persecuting innocent charities seeking to help the poor. The assertion from MPAC and likeminded groups that law enforcement must prove a terrorist attack is about to occur in order to arrest someone is based on "a misunderstanding" of the law, Garrett said. They fail to grasp" that terrorism is much more than committing an overt act of violence. He said groups like Hamas engage in "social engineering" – using zakat, or charity committees –to build a cradle-to-grave "social welfare" organization that guides every aspect of life. Much of the money goes to "charities" that have the veneer of legitimacy. "Everyone wants to stop the bomb," Garrett said. "But how do [terrorist groups] build the man carrying the bomb?" Material support prosecutions are critical to answering that second question – by dismantling the terror networks that make suicide bombings and other horrific acts possible, he added. Blitzer suggests CAIR and MPAC are motivated by hostility toward law enforcement rather than genuine concern for civil liberties. FBI bashing "is good psychology: Put law enforcement on trial. Make it harder for them to do their job," he said. "Tie 'em up in court and on the street. Make the law enforcement people the 'bad guys.'" This is just another example of CAIR and other Islamic terrorist organizations using our system of human rights to wage stealth jihad here. I beieve in our rights, all of them, including the First Amendment, but CAIR is known to be a part of the Muslim Brotherhood, and anyone who knows who they are, should agree that this organization has got to go. I think they should be infiltrated and when the obvious is discovered, should be sent packing. The best way to emulate the Prophet Muhammad, is to follow his example and live on the desert.